Gov. Rick Perry is defending so-called “pink slime” in a statement issued in conjunction with Iowa Gov. Terry Branstad, Kansas Gov. Sam Brownback, Nebraska Gov. Dave Heineman and South Dakota Lt. Gov. Matt Michels (on behalf of South Dakota Gov. Dennis Daugaard, who’s on a trade mission to China). Since she’s been the chief troublemaker in all this, I’m going to let Bettina give the response. When I started my Change.org petition on March 6th, I had one simple, clearly defined goal: to ask USDA to revisit its practice of providing school districts with ground beef containing LFTB. The USDA/schools petition went viral, garnering almost a quarter of a million signatures in a little over a week (and now exceeding that target). USDA responded to the outpouring of concern by offering schools the option of buying beef without this filler. And that might have been the end of this story. But clearly something else arose out of my petition and the media coverage associated with it. Consumers learned — many for the first time — that USDA allows LFTB to be mixed into the nation’s ground beef supply, up to 15%, without any labeling to disclose that fact. Reportedly, 70% of beef in this country now contains LFTB. And as it turns out, consumers are quite unhappy about this fact. Some people are concerned about food safety, given the pathogenic nature of the raw material used by BPI to make the product. Its safety record, though now admirable, was somewhat more troubling between 2005 and 2009 when E. coli and salmonella were repeatedly found in its product, as reported by the New York Times. Some consumers – rightly or wrongly — worry about the use of ammonium hydroxide in the processing of their food. Some people consider the inclusion of an unlabeled filler to be a form of economic adulteration, in that their package labeled 100% ground beef might only be 85% ground chuck or ground round and the rest a gelatinous meat filler. And others claim there are aesthetic differences between beef with LFTB and pure ground beef. Whether any or all of these concerns are valid is almost beside the point. Our free market is founded on informed consumer choice, but in this case USDA deprived consumers of the ability to make that choice when it made the controversial decision to treat LFTB as “ground beef,” no different from ground chuck or ground round. Now that the truth about LFTB is coming to light, BPI’s business may be suffering. But this consumer reaction should not come as much of a surprise to the company; why else did BPI, according to the Times, lobby USDA back in 2001 to exempt their product from labeling? As I said in an interview on the very first day of my USDA/schools campaign, the use of LFTB in ground beef is “one of those practices that can thrive only in obscurity.” Now exposed under intense media scrutiny, BPI is discovering that this is indeed the case. 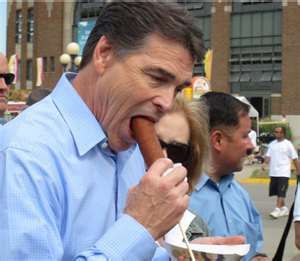 Of course, Rick Perry also works best when he operates in obscurity, so I suppose none of this should come as a surprise to anyone. It’s a true meeting of the minds. Feds to Texas: Fix food stamps! Branstad, who received $150,000 in campaign contributions in 2010 from the founders of BPI, organized the governors’ tour and press conference, but told ABC News that the contribution played no role in his decision to hold the event. The Safe Tables website until recently listed BPI as its largest funder, providing more than half the organization’s budget. However, the disclosure of BPI’s funding recently was removed from the website, with Safe Tables saying the donor now wishes to be anonymous. The relationship was not mentioned at today’s news conference or in a recent ad in the Wall Street Journal in which Donley defended the company.